Measuring social media ROI is key to securing buy-in and budget for your social marketing strategy. In this post we’ll give you the tips and tools (including a free ROI calculator) you need to prove and improve social ROI. What is social media ROI? If you were measuring ROI by revenue, for example, a simple formula to do that looks like this: Revenue / investment (people hours, ad budget, etc.) You can do this for a specific timeframe to determine the ROI of a campaign, or calculate how much time your business spends on social media every month or year. You can use the pixel feature within Facebook’s own ad platform or with social ad optimization and targeting tools like Hootsuite Ads. How to report the ROI of social media Once you’ve set your goals and chosen your tools, it’s time to actually track and report results. What new platforms and technology are changing the way your audience is using social media? Measuring social media ROI gives your organization valuable insight into the success of current and past campaigns, and what might work in the future. Use Hootsuite Impact and get plain-language reports of your social data to see exactly what’s driving results for your business—and where you can boost your social media ROI. Measuring social media ROI is key to securing buy-in and budget for your social marketing strategy. It also shows you what’s working and what’s not—allowing you to shift resources and tactics to be more effective. In this post we’ll give you the tips and tools (including a free ROI calculator) you need to prove and improve social ROI. ROI stands for “return on investment.” What that means for your social media strategy depends on your organization’s objectives (brand awareness, revenue, customer satisfaction, etc.). But, generally speaking, social media ROI is the sum of all social media actions that create value. After all the time, money, and resources put in—what’s the return? But that’s not a catch-all formula for proving social ROI. Again, there isn’t one definition (here are a few more common social ROI formulas). Not every organization will be able to attribute revenue directly to social media. Nor should they. Value isn’t always measured in dollars and cents. Tethering ROI to such a strict definition prevents you from identifying other ways an investment might be paying off. If you’re not sure what to measure, ask yourself what kinds of things your target audience did after exposure to your campaign. Did these actions align with your goals? Where did they fall short? How can they be improved for next time? To calculate the value of certain actions (purchases, page views, downloads, sign ups, etc.) look to analytics to determine which ones came from social media. 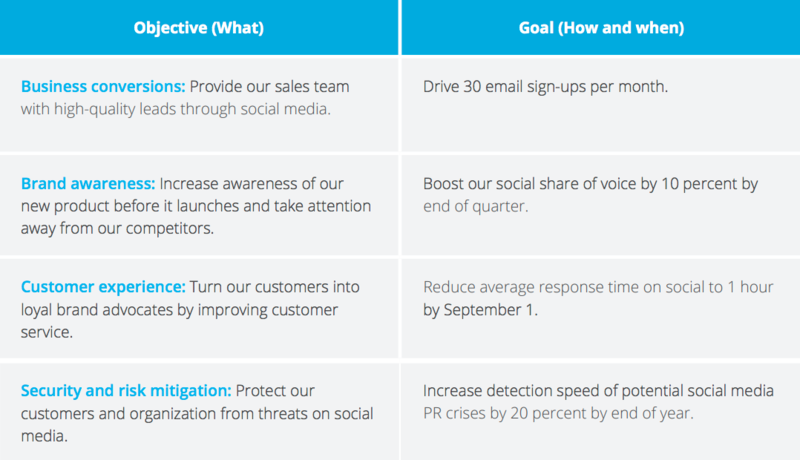 This helps you define your social media ROI and prove the value to your organization. Ready to get the most out of your social media strategy? Watch our three-part webinar series and learn everything you need to know about proving and improving social ROI. Talk is cheap. Sure, you could tell your stakeholders or clients about the value of social and why they must invest in it—but nothing will convince them more than data. When there are measurable and specific outcomes, people take notice. Social media spending in the United States alone is expected to hit $17.34 billion in 2019. Still, only a fraction of marketers say they are able to prove its value. To do it yourself, you need to follow three simple steps. Brand awareness created by social media (shares, likes, followers etc.) is valuable, but not always enough. According to Altimeter, only 34 percent of organizations feel that their social strategy is connected to business outcomes. To show value, you need to set social media objectives that are aligned with business and departmental goals. If you need help setting goals, we recommend using the S.M.A.R.T. framework. Here, each goal must be specific, measurable, attainable, relevant, and timely. If your objective is to grow conversions, a good goal might be a specific number of leads you want to drive via social for the quarter. Another example of a business conversion goal would be increasing landing page conversions by 10 percent. You would measure this by tracking the conversion rate of people who land on the page from social channels. Whatever the goal, be sure to measure past performance to establish benchmarks. And then set targets for improvement. For more on this, check out our step-by-step guide to setting smart goals. You need social media metrics to determine whether you’re achieving objectives and meeting your goals.